Or if I wanted them fully upholstered. I actually like the look of the exposed frame just a tiny bit more but when it comes right down to it, I just don’t think it’s possible to do that on my chairs because the cane backing is attached so closely to the edge of the frame. In order to cover up the cane backing, there would only be about 1/2-inch of frame exposed on the sides (perhaps less if I use piping), so that kind of defeats the purpose. But that’s okay, because I really do like the look of a fully upholstered chair also. And I came across two pictures that really made me excited about the possibility in my dining room. The first one was this dining room, with the gorgeous raspberry dining chairs with the white piping, tufted backs, and white buttons. Here’s a closer view of those same chairs in that dining room. Of course, those chairs are a very different shape from my chairs. 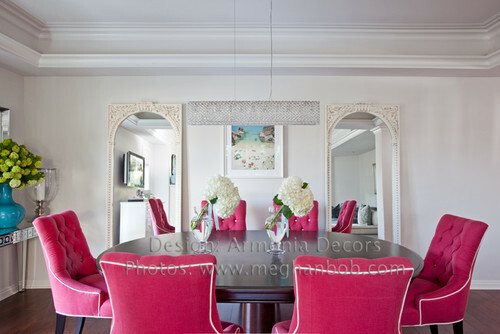 But then I came across this dining room by one of my favorite designers. Its the same concept, and the shape is closer to that of my chairs. So you can picture a tufted back on these rectangular back chairs with the solid coral fabric and white piping. But anyway, on to the fabric. 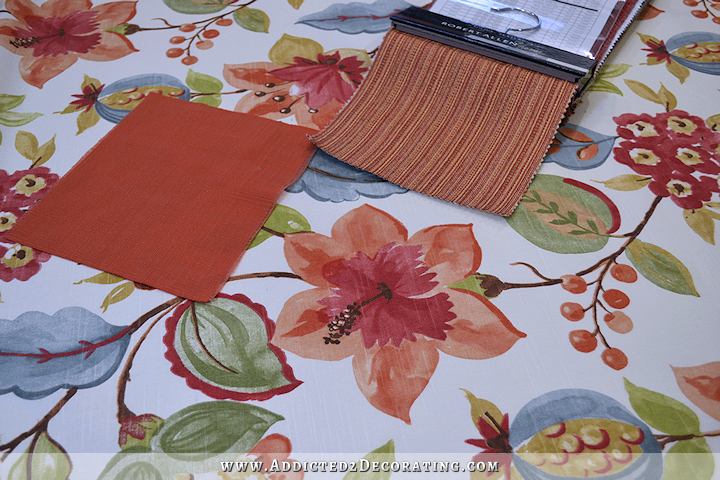 I ordered the solid coral fabric for my side chairs. It’s Richloom Forsyth Coral. The color on that website isn’t accurate at all. Mine looks a bit more accurate to me, but the color is pretty much exactly the color that the buffet used to be. For the host chairs, I decided to go with a combo of the Richloom Anamarie Aspen fabric and the Robert Allen Run Along Sunburst, both of which are on sale for 60% off right now. I still plan to build my own host chairs, with the floral fabric wrapped around the back and sides, and the other fabric used for the seat and front of the back — basically the areas that will receive the wear and tear. So that’s the plan! 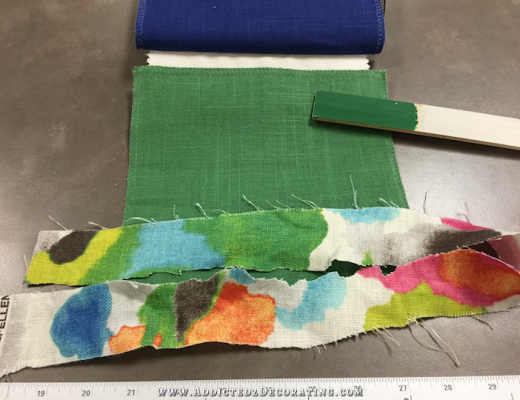 Fabric has been ordered, and things are moving forward. Sounds like a plan. I agree about the floor length skirts. I can envision cat hair clinging to the bottoms plus they get dusty. Love the fabrics, wish there was a bigger picture of the floral. I love the pattern and the colors. I think you made a good choice. Will be a lot of work, but worth it in the end. Have fun. PS had I known you HATED brass lamps, I never would have mentioned them. Those three. Fabrics look great together. Can’t wait to see everything put together. Super excited to see the process on the chairs, I love learning new techniques from you! Any progress on the outside of the house yet? No progress yet. The weather has been pretty rainy and/or windy for what seems like weeks now. April is generally pretty wet here, so it might be May before I can get anything done to the exterior. The problem is that I read that after a rain, you should give the house three days to dry before painting, and I think it’ll take me at least three days to paint. I don’t think we’ve had that many dry days in a row (that weren’t either really windy or too cool for this Texas girl to spend lots of time outside) in about six weeks now. Hopefully May will be a bit dryer so that I can make some progress outside. Good morning Kristi. Happy to see your post this morning. I’m just trying to recap your vision so far to see if I’m following it correctly. The fabric you just ordered/purchased is for 6 side chairs & the 2 host chairs that came with them will be placed on each side of the buffet that is now black. (love it). They will be in the solid coral. You are going to build 2 new host chairs with cordinating fabric. The table is now white with gold trim. You are going to have floor length black/white horizontal striped drapes. Did I get it right? Trying to I vision it in my head. I thought we were going to see drapes this morning, but I remember you said you hated to sew. Wish I had your talent. I was also hoping to see buffet with both lamps. I loved seeing the finished projects. I know you probably sometimes feel over whelmed & have to stop to regroup, so please don’t feel like I’m trying to rush you. I just love seeing the finished work. I started following when you moved the old kitchen cabinets around and it turned into a remodel. Really love your fabric choices and they seem more ‘you’. Can’t wait to see it all come together with the chairs being upholstered. They are going to look stunning. IMHO, whilst I love the look of full skirts on chairs, I just don’t think they are practical at all, especially when you are cleaning the floors, peoples shoes against the fabric etc. I know when I’ve sat in chair with a full length skirt, I felt very uncomfortable and didn’t know where to put my feet, as I didn’t want to put my shoes against the fabric. Make sense? Again, IMHO, I think the short skirts look kinda frilly and a bit old fashioned. Looking forward to seeing your progress as always. I discovered you thanks to Marigene, and I really enjoy your blog. 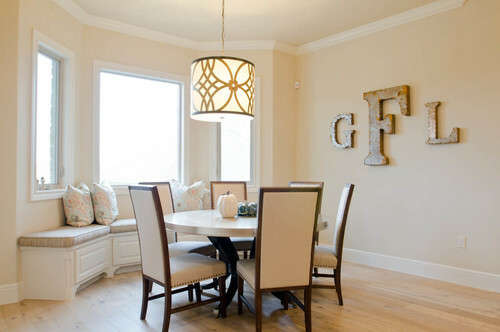 I am a big fan of Tobi’s work too, and I think your dining room is going to look fabulous. I have subscribed your blog, because I want to make sure I don’t miss any! That doesn’t look like embroidery on those chairs to me. I’m guessing it’s that flat cording like what you’d see on mariachi pants, and you definitely have the skills to sew that on yourself. I hadn’t thought about the cording, and I think that’s right! Looks just like the cording/piping on the rest of the chair. I love the long skirts, but I agree about the practicality. It’s one of the things I hated about puddled drapes. Another thought is that pattern could be painted onto the fabric very easily and can still look nice, and i know that is something you know how to do. Great job so far, I love the fabric choices. I love your fabric choices. Very pretty. I too love a spot of embroidery on the back of dining chairs. Tres chic! You might try a sewing machine retail store that sells embroidery machines to find someone to do your machine embroidery. Here in the Pacific Northwest it would be Quality Sewing and Vacuum. There are so many people who have embroidery machines that I think you wouldn’t have any trouble finding someone to do your job. Also, where did you find your fabrics…especially with such a good sale? Keep up the good work. I know it can be daunting but just look at how far you have come. Looking forward to seeing you put this all together. You have me eyeballing my horrible oak dining room chairs and wondering what I can do with them! I definitely see them in a different light (transforming them rather than replacing them) thanks to you! Love your choices!! 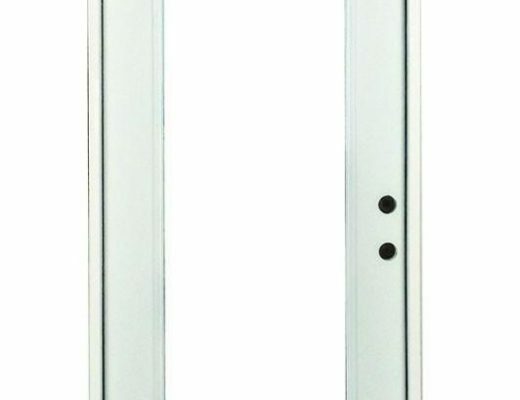 This room is really going to make a statement upon entering your home! I love that floral fabric. I can’t wait to see the end result. Will you be posting a tutorial on how you build the chairs? I learn so much from you! It would be fantastic if in your spare time (hahaha) you would put on some workshops to teach your many skills to some of us lesser talented/skilled individuals. I would certainly travel the 650-ish miles to learn from you. Agree with Mary Anne’s cat hair comment. The navy blue skirted sofa we used to have was always covered with cat hair. I used Roomba extensively though and I think that made it worse. Our Roomba, Wanda, seemed to end up pushing the hair ahead of her and it always stuck to the skirt. The fabrics are so pretty all together. Once again, you are teaching me to step out of my comfort zone, mixing colors and fabrics to end up with a sophisticated look. I can’t wait to see a finished chair! 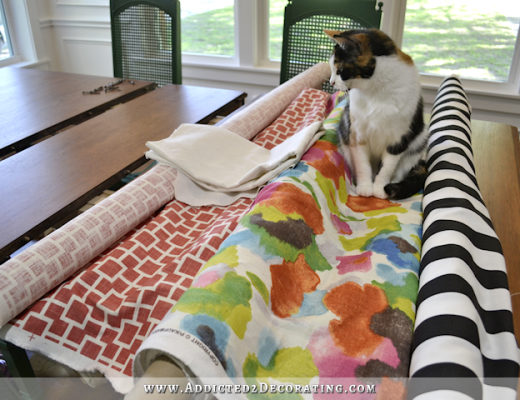 Love your choose in fabric for both chairs. And when finished they will be stunning. This area is coming together beautifully. And you must be very happy now with your chooses. Just amend my comment on flat cording. I think you can get a nylon type and burn the end so it won’t ravel. Attach using fabric glue (tack in place, maybe?) and then sew on to secure. I’m sure there are tutorials so that you could make it come out perfectly. Adding—- Suddenly getting pop up ads on your page. I close them, but there’s an annoying video one in the middle of your post that I can’t eliminate. Just thought I’d mention. I am not meaning to be rude or mean in any way, but I just can’t get on board with your new plan. I was so getting the black and white stripes with that other floral and white walls, green tabel etc. you had going on before. It was bright and clean and vivid. So I’m disappointed you have dropped it cuz I loved it. Maybe when it’s all done I will get it, but for now, no sir, I’m not digging it. But I wish you all the best and sincerely hope that YOU love it cuz in the end that’s all that matters. Great fabric choices. The dining room is going to look amazing! I’m sure when all is said and done it will be beautiful (your work always is), but I’m having a bit of heartbreak over covering the cane and destroying the sweet finials on your dining chairs. I love their unique and airy look and will be sad to see that lost. The photos of upholstered chairs you’re posting are also nice, but they seem more generic and therefore less exciting to me. But I guess I’ll just have to get over it; After all, it is your dining room 🙂 and I know it will be great. I know. Those cute little finials. 🙁 You have no idea how much time I’ve spent staring at those chairs, trying to make it work with leaving the frame exposed. I just can’t seem to make it work. I’m sad to see the little finials go, but hopefully when all is said and done, I won’t regret it. If you decide to go the embroidery route, Darlene at Embroidme San Antonio could help you out. She does great work! Hmmm, I’m kind of surprised at your choices. They seem so… tame and traditional. I love the colors in the floral, but I thought you were going for something more modern and bold, with black incorporated. Oh well… looking forward to seeing what designs you settle on for the chairs. those chairs! I hate to see you cover up those cute finials! Just wondering if you would somehow remove the caning and use fabric and batting covered boards that would insert into the space where the caning was. You wouldn’t lose those details! However, without being there to see how the chairs are assembled I have no idea how you would get those panels to stay put! Like I tell my husband, I’m just the idea person, logistics is his department 🙂 Keep up the great work! I love seeing what you’re up to! 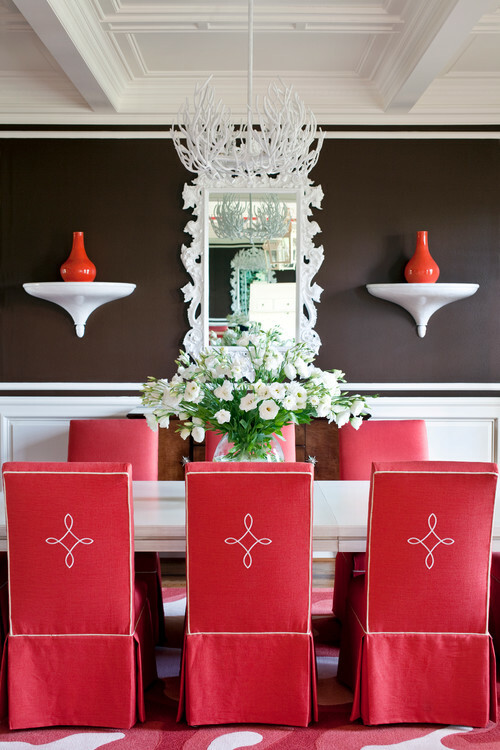 Love those coral chairs in the inspiration photo. I know the long skirts would be covered with cat hair HERE (and snags!). If you can’t find someone to embroider the white trim, what about soutache braid? Just a thought. I can’t wait to see how everything comes together.